Harmonic distortion is a term we hear often when discussing specs of analog components, but what is it exactly? And how is it useful in our day-to-day work with audio? There are many digital tools for surgically and effectively adding harmonic depth, excitement, heavier distortion or anywhere in between (i.e. Vitamin Sonic Enhancer, Cobalt Saphira). In this article, we focus on the style of harmonic warmth and excitement inherent to analog components. The coloration involved in digital recording leaves us with a comparatively clean harmonic palette, so if we want to enjoy the warmth of yesteryear’s recording equipment, we must consciously decide to add it to the mix. Harmonics are whole-number multiples of a sound’s fundamental frequency that psychoacoustically excite the overall timbre, adding depth, color, presence, character or warmth to a sound. Any sound which is more complex than a simple sine wave has inherent harmonic content above its fundamental pitch, making the timbral distinction between the sound of a violin versus a flute, piano, or guitar all playing the same note. There are two simple types of harmonics: even and odd. Even harmonics are the result of even number multipliers (2, 4, 6, 8, etc.) and odd harmonics are the result of odd number multipliers (3, 5, 7, 9, etc.) of the fundamental frequency. For example, if your fundamental tone is a 1 kHz sine wave, 2 kHz would be an even harmonic and 3 kHz would be an odd harmonic. Each set has a distinct resultant feel and is important in exciting a sound. These same additive principals are at play when passing audio through analog equipment as the components add artifacts to the signal, altering and adding to the original sound. These distortions are created by physical limitations of the electrical components, which together change the source sound. Some components like vacuum tubes and transformers distort the sound in a musical way when well-designed. Magnetic mediums like analog tape will also distort the signal in the form of harmonic distortion, modulation distortion and compression. The degree to which we drive the limitations of these components determines how prevalent the distortion will be. The most obvious examples of the differences in harmonic distortion characteristics were in the varied sounds of analog consoles from different manufacturers. Unless you have experience working with several vintage consoles, it may be difficult to understand the totality of the varied characteristics. Each console maintains a unique sonic signature as a byproduct of careful design. All this begins with the pre-amplification stage. Whether tube-powered, as in the preamp emulations of the REDD consoles of Abbey Road Studios, or solid state in the form of the TG12345, Helios and Neve consoles, the preamp stage sets the distinctive tone upon which the rest of the sound is shaped. The first Helios console was custom built for Olympic Studios back in the 1960s and used by legendary artists Jimi Hendrix, The Rolling Stones, Led Zeppelin and many others. This solid-state design was part of a movement toward more aggressive sounds that defined much of the music from the late 60s through the 70s. The Helios console’s preamp stage has a warm sound at nominal levels and quickly takes on a hard, edgy sound when driven hard. The mic/line preamp settings in the Kramer HLS plugin offer an entry point into its sonic signature. On the original console, setting the preamp to higher settings to drive more harmonic distortion would also drive more level, but the Kramer HLS emulation allows you to toggle through the different preamp settings without added gain. The Neve consoles of the 1970s are legendary for their warmth and punch. 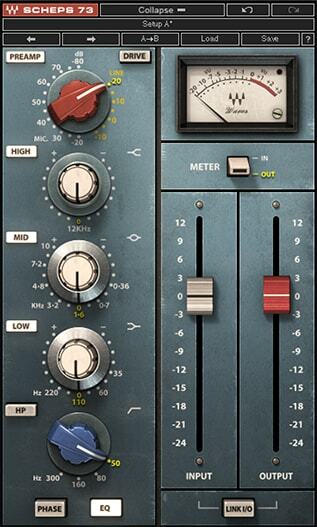 The most widely acclaimed preamp of the Neve console is a component of the 1073 EQ. With its rich Marinair transformer, this preamp excels in adding warmth while preserving dynamic punch in the midrange frequencies. 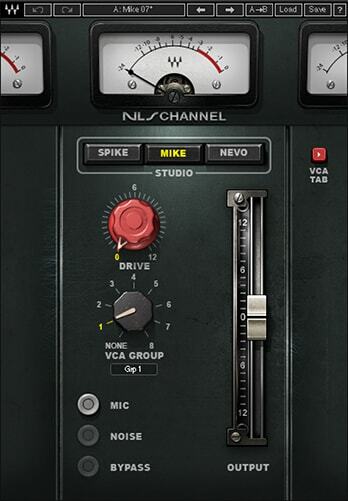 The broad dynamic range of the Neve preamp stage keeps it very rich and warm sounding. If you drive a line-level signal into the mic preamp, all the rich, harmonic solid-state edge comes pouring through. It’s a perfect complement to the 3-band tonal-shaping powerhouse 1073 EQ. Preamp stages for line and mic level signals are also switchable in the Scheps 73. Unlike the subtly of the cleaner preamp setting, the drive setting introduces a healthy dose of harmonic distortion, loaded with edgy harmonics. Don’t forget to balance the output level when using this setting! For a signal to pass through the preamp stage to a recording medium and to the speakers for monitoring, it passes through loads of electronics. The electronic components add artifacts which affect the frequency response, harmonics, clipping and noise embedded in the sound. The cumulative effect of all these components colors the sound, even when no equalization or compression is added into the signal path. While no isolated component makes up the total ‘sound’ of an analog console, Waves NLS fills in the gaps of parts between the entry and exit points of a full sound console, including the interplay of several channels being summed together. It is these Non-Linear Summing (NLS) components of unique channel strips coming together in the mix buss that is a vital part of the total sound. What’s most interesting about analog consoles is that no two channel strips will ever sound exactly alike. This is due to the reality that each component part can never be made perfectly the same. To keep things authentic, the NLS plugin factors in 32 variations of channel strips along with the final mix buss summing electronics. Adding this to your mixes will introduce the subtleties of running sound through one of three varied analog consoles to choose from. 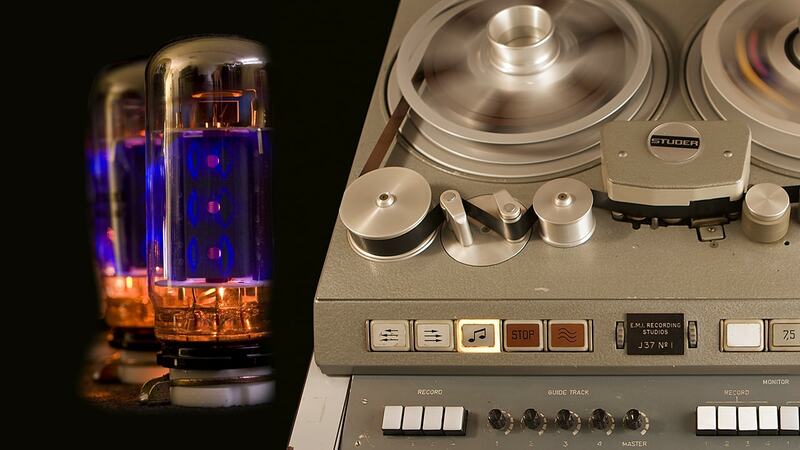 Since the late 1940s, tubes and analog tape have been a vital part of almost every recording through the 1980s. 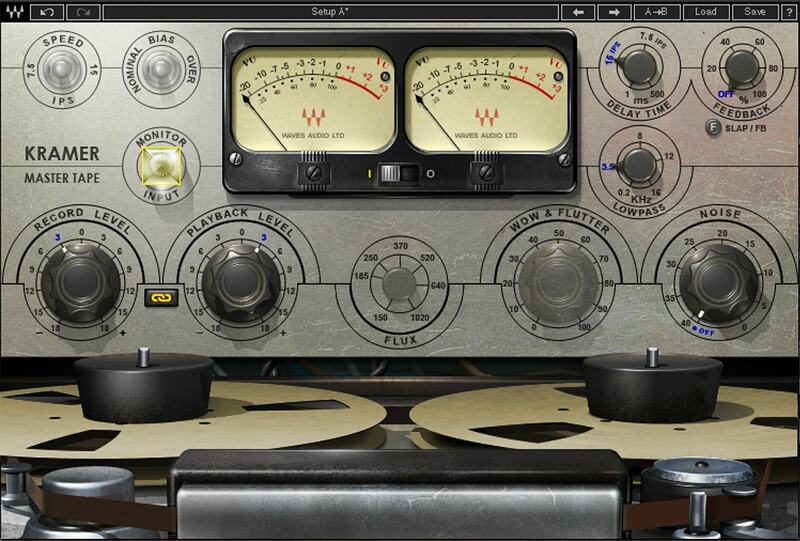 While digital recording, for the most part, replaced analog tape over the ensuing decades, their ‘sound’ is still available in the form of captured and recreated plugin emulations. 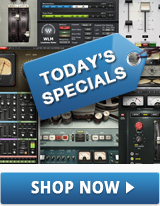 Tubes, on the other hand, have been more enduring in hardware form but have also made a strong comeback in the DAW realm. Tubes have been a powerful part of making the music we love sound better. They can add warm odd harmonics that bring fullness and listenability to digital recordings, depending on design. Coupled with the harmonic distortion characteristics of tape, adding tubes for warmth and the natural sound of tape compression together makes the Kramer Tape and J37 emulations a classic combo that can’t be beat. Tape machines of the 50s and 60s often used tube electronics at the input and output amplification stages as a way to enhance the audio quality. This was true of the Ampex 351 tape machine emulated into Kramer Tape. What’s most amazing about this emulation is the way the tube stage’s harmonic distortion characteristics were captured separately from the tape compression characteristics. This allows the plugin to be used with the tape reels turned off, to be used solely for tube warmth if the need arises. Magnetic tape is a medium that allows analog audio to be recorded in the form of alternating magnetic fields. Controlling the frequency response and distortion characteristics of tape is somewhat a complicated matter. The design of tape machines from the record and playback heads, to the bias current, fluxivity levels, and equalization calibrations, all while attempting to minimize the resultant tape hiss, made this a finicky medium to say the least. 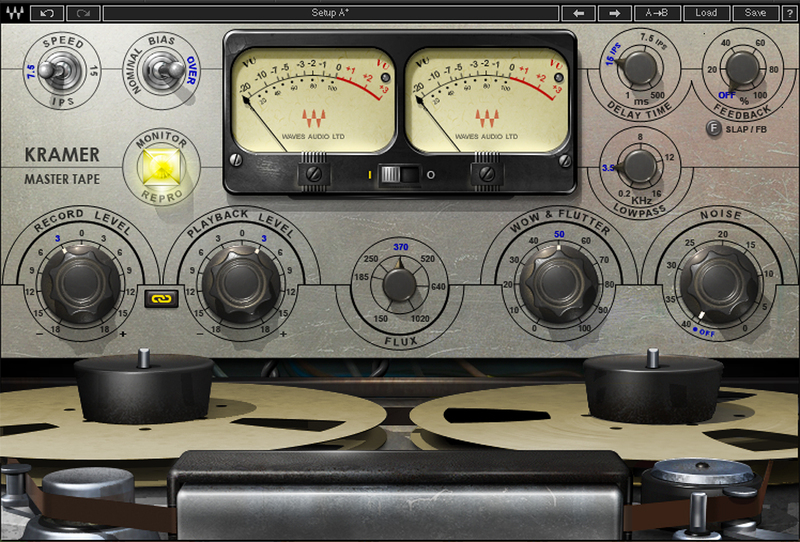 The Kramer Tape plugin includes control of its flux setting, which determines the amount of tape saturation and resulting compression and harmonic distortion. The J37 tape machine was designed for Abbey Road studios by tape machine pioneer Will Studer. It was a 4-track 1-inch tape machine format that used 3 exclusive tape formulations, each bringing a unique harmonic distortion characteristic. Coupled with a whopping 52 tubes, tape speed, bias and saturation controls, this is a harmonic distortion machine. When the settings of tape speed, tape formulation, bias, record level and saturation are calibrated correctly, the J37 is a powerful artistic tool to shape any sound. Driving analog components to enhance the qualities of a sound was a very selective process for most engineers in the analog era. The perception of distortion, after all, is a relative thing. Heavily distorting a lead vocal, for example, is more effective when the sounds around it are less distorted. Therefore, harmonically distorting everything in a subtle way will create a distinct tonal character that increases listenability and leaves room for more aggressive processing. The Aphex Aural Exciter, created in the mid-1970s, was truly the first piece of gear that was specifically designed to bring “hype” into music production. Unlike all other professional audio gear of the time, the specific purpose of the aural exciter was to add synthesized harmonic distortion within specific frequency bands as a means to add presence and brightness to dull recordings. What’s most notable about the original units created by Aphex was the addition of tubes to add warm odd harmonics to balance the added presence in the upper frequencies. It was primarily used on vocals and other lead parts, but sometimes even on full mixes for mastering where enhanced presence was desired. The best way to approach harmonic distortion processing is to experiment with a little going a long way. Engineers of the analog era would specifically choose a console that added the tonal coloration that they felt would best enhance the style of music they were recording. They’d carefully decide how hard to drive the console to capture the appropriate amount of harmonic distortion without compromising the listenability of the music. Try creating a console setup using NLS, J37 Tape and an EQ like the Scheps 73 across all channels to create a signature sound. You do not need to use the console EQ for all of the tracks but do carefully adjust the preamp settings to subtly shape the tone of each track. When adding additional vintage compressors or EQs, be selective in their use rather than using them indiscriminately on everything. 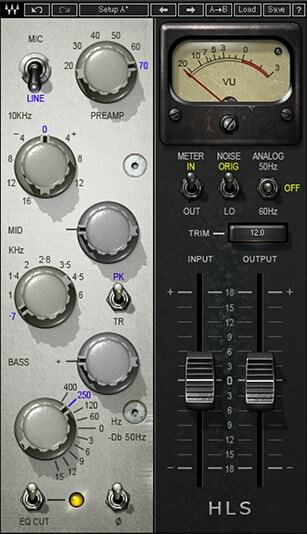 If the lead vocal is the only track that has a PuigChild Compressor, it will reap the benefit of its unique harmonic distortion characteristics and stand out from the rest of the tracks. With care and practice, the methods and sonic characteristics of the past can come full-circle into your DAW and into your music. When professional digital audio recording devices found their way into pro studios in the 1980s, most engineers did not consider the importance of harmonic distortion in the music they recorded and mixed. Because all recording and mixing was analog, and all analog components exhibit varying degrees of harmonic distortion, it had always been inherent in the sound of recorded audio; it was the equivalent of asking a fish what it’s like to live in water all the time. At the time, digital recording devices were only avoiding the harmonic distortion of analog tape and still enjoying that of the analog components used to record and mix the music. The removal of tape hiss, crosstalk and print-through were welcome improvements, but digital recording was still largely resisted by many engineers. When digital mixing consoles entered the marketplace, a similar refrain was echoed: but mostly in the form of the simple statement “analog just sounds better”. As digital technology developed with better clocking, converters, and higher sample rates, the quality of digital audio improved tremendously but still often felt as if it was missing that ‘special something.’ Engineers realized that the harmonic distortion characteristics of analog technology were a large part of the sounds they had been achieving. Today, technological breakthroughs have circled back to the endearing analog sounds we know in the form of emulations that offer aspects of analog audio we may have never knew we needed so much. For more on shaping the sound of your mix, see our 8 buss mixing tips and for more on vintage plugin emulations, see our tips on working with vintage modeled EQs.